Mazda recently issued a recall of nearly 80,000 cars and SUVs, shortly after an initial recall in January, to replace defective airbags. The defect arises from dangerous Takata airbag inflators, which are located in the front passenger side of certain 2007 through 2009 and 2012 CX-7, CX-9 and Mazda 6 vehicles; recalls vary by state and age of the vehicles. Mazda is just one of 19 automakers affected by the Takata airbag recall. With tens of millions of vehicles in the United States subject to recall, The National Highway Traffic Safety Administration (NHTSA) has dubbed it as “the largest and most complex safety recall in U.S. history,” making it a significant auto defect and crashworthiness issue. The comprehensive list of vehicles affected by the recall is located at the bottom of this article. Takata airbag inflators can explode with too much force and hurl shrapnel into drivers and passengers. It is reported that as many as 19 people have been killed and more than 180 injured due to these defective airbags. Some of these deaths and injuries don’t even occur while driving. In June 2016, a man was tragically killed while repairing a 2001 Honda that was parked in his driveway when the defective airbag exploded. Of the 19 automakers affected, Honda seems have the largest number of defective airbags. The initial Mazda recall from January 2017 only replaced the Takata air inflators temporarily with the same parts that could deteriorate over time. Takata claims that the latest recall will use safer, permanent parts. 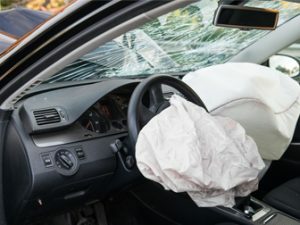 According to Consumer Reports, the problem lies in the airbag’s inflator, a metal cartridge loaded with propellant wafers, which in some cases has ignited with explosive force. If the inflator housing ruptures in a crash, metal shards from the airbag can be sprayed throughout the passenger cabin. This explosion can cause serious injury and even death. The NHTSA has determined that the root cause of the problem is an ammonium nitrate-based propellant without a chemical drying agent in the airbags. Environmental moisture, high temperatures, and age increases the risk of defect that can improperly deploy the airbags. This issue dates all the way back to 2002, and the New York Times accused Takata and Honda of knowing about the problem by 2004 and attempting to hide it. In January 2017, Takata pled guilty to charges of wire fraud for providing false data, and agreed to pay a $1 billion fine. In June 2017, Takata filed for bankruptcy, unable to recover from the airbag crisis. While still facing personal injury and economic loss lawsuits, multimillion-dollar fines and crushing airbag recall costs, it has agreed to sell its surviving operations to a Chinese-owned American rival, Key Safety Systems. Just yesterday, August 17th, 2017, a Delaware bankruptcy judge ordered a temporary halt on hundreds of these airbag-related lawsuits while Takata restructures itself before its planned $1.6 billion sale to Key Safety Systems. As of August 9th, 2017, Nissan is the latest automaker to settle a civil lawsuit that will compensate owners for economic losses while vehicles undergo repairs and owners driving the most at-risk vehicles are provided with rental cars. Nissan will also pay for advertising and outreach to encourage more owners to schedule repairs with their dealers. Nissan’s $97.7 million settlement mirrors the $553 million settlement that BMW, Mazda, Toyota, and Subaru agreed to pay in May of this year. A total of 4.4 million Nissan and Infiniti vehicles have been recalled in the U.S. Only 30 percent have been repaired.